In our previous entry we highlighted how New Super Mario Bros. was the first new 2D Mario title in some time; that was due to a general focus on 3D Mario gaming. From the DS / Wii era onwards it's the 2D games that have been greater commercial successes, yet when considering critical acclaim from gamers it was the Wii's 3D Mario debut that truly set the bar to new heights. 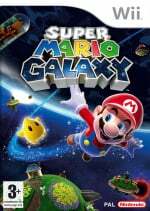 Super Mario Galaxy is considered by some to be among the greatest video games of all time. The idea of the title originated with a GameCube prototype, yet it's a reflection of the technical challenge posed that it would pass to the Wii generation, with Galaxy arriving about five years after Super Mario Sunshine. In an Iwata Asks interview for Galaxy's release, the game's director (Koizumi) and producer (Shimizu) talked about those origins, and how daunting the challenge was for Tokyo EAD which was, at the time, a relatively small and recently created studio. Koizumi: In Mario 128, the platform was built in the shape of a flying saucer, but in order to change the platform into a spherical shape where Mario could freely roam around, it would require a high level of technical expertise. I also felt that the motivation of the team members had to be very high in order to overcome this obstacle. Iwata: Incidentally, I had heard about the spherical platforms from Miyamoto-san more than five years ago, though at the time, I didn't quite understand why having spherical platforms would be so ground-breaking. However, as Mario Galaxy began to take shape, I finally started to understand. Koizumi: At the time, I felt the same way. It sounded interesting, but I wasn't sure whether or not it would be worth the effort. Thinking back, this probably was a thought that was shared by everyone on the staff. But Miyamoto-san kept saying over and over again that he wanted to make it happen. Koizumi: The EAD Tokyo office had just opened in 2003, and at the time, we didn't think we were able to make such a large-scale game. So I had suggested plans for a rather smaller, compact game title. But then Miyamoto-san asked me, "Don't you want to work on something bigger?" So I asked the staff members for their opinions, and somebody on the team said he wanted us to use our skills to make the next Mario game with our hands. By working on Jungle Beat together, I got to know the staff well enough by then, and I thought, if it was with this team, we may just be able to tackle the new and difficult challenge of making spherical platforms work. Though the intention had been for the title to launch with the Wii, extra time was taken to make sure it was up to scratch. It generated huge buzz in the build-up to release primarily because of that spherical approach and the outer-space setting, as it was a dramatic upping of the ante from its direct predecessors. The ambition was realised in impressive terms, with the release earning significant acclaim when released. It was not just a design tour-de-force in terms of its stages and implementation of gravity, but for its sensitive usage of the Wii Remote and Nunchuk. The addition of the spin move was to assist players who would find jumping on enemies difficult in gravity-defying 3D, and this was smartly mapped to a quick shake of the Wii Remote. Grabbing star bits with the pointer was also intuitive, and so standard analogue stick and button controls were carefully combined with Remote shakes and pointing. It worked beautifully. 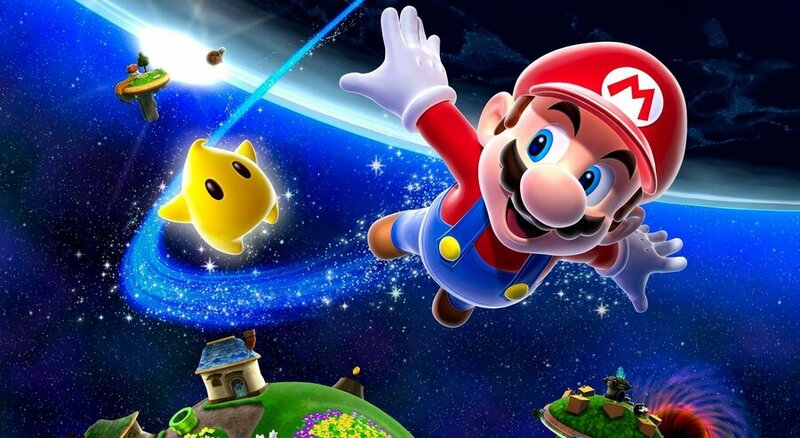 Super Mario Galaxy's legacy is also deeply rooted in its soundtrack. Nintendo has embraced live bands and orchestral scores in various franchises now, but Super Mario Galaxy set the standard for this approach. Its soundtrack has since been released as a CD for sale or on Club Nintendo, depending on region, and is fondly remembered by many. Just recently this writer shared personal memories of why this game matters, and it's to the credit of this title and its sequel that there are still regular calls - in vain so far - for a third title in this particular series. One of the greatest games on Wii. In fact it's arguably one of the greatest games of all, regardless of system. I picked up the Nintendo Selects version of Galaxy last year, and regretted not getting the game sooner. It was my first 3D Mario on a console, and I loved nearly every second of it. It still remains my favorite 3D platformer. I liked Galaxy a lot. it was quite an improvement from SM64 and the tedious and boring Sunshine. i still prefer SMG2 but this one is much better. "One of the greatest games on Wii. In fact it's arguably one of the greatest games of all, regardless of system." Let's not get nuts, ok? Not bad... but it didn't really wow me like previous 3D Mario games, due to the linearity of the stages. And the controls felt a bit off, especially when walking around planetoids. Never cared much for the Wii, but this game is a masterpiece. Best game of last generation, for sure. I've been replaying Galaxy recently, and it really is a wonderful game. It came out in 2007, but it doesn't feel that old because of how brilliant it still is. It's not perfect, but I can see why others say this is one of the best games of all time. Definitely one of my favorite Mario games. I like to compare the 3D Mario titles with the earlier 2D ones. Super Mario Bros and Super Mario 64 created industry standards in the platforming genre, in 2D and 3D respectively. Super Mario Bros 2 (the U.S. release at least) and Supet Mario Galaxy are the black sheep; some loved them, some hated them, either way they had a very different feel and yet introduced characters that would stay through the series. Super Mario Bros 3 and Super Mario Galaxy were both climactic moments for the series. They got incredible long term praise and are many times argued as some of the greatest games created. Super Mario World and Super Mario Galaxy 2 took the previous entries and stood on their shoulders to shatter the glass ceiling. They adopted the most from their predecessors but made it bigger, polished it up, and threw Yoshi into the mix. I realize the comparison isn't perfect but it makes sense to me. I loved Sunshine but Galaxy managed to rekindle fires from Super Mario 64. Sure it was a bit more linear (one of its few flaws, combining it with 64's open ended worlds would be phenomenal) but it captured the Nintendo magic of old. I still say the camera is this game's fatal flaw. I gave up on the game and sold it when I couldn't deal with it. 3D platformers work best with an automatic over-the-shoulder camera (with manual adjustments possible on rare occasions when you need a different view), or occasionally a fixed viewpoint camera that changes position at different points if the levels are designed around such a system. However, this game makes the mistake of utilizing a static, completely manual camera, which is especially bad with the spherical platforms, as you're forced to either spend half your time walking sideways or upside-down or to make nearly constant manual adjustments while in the heat of the action. Sorry FLUX_CAPACITOR, but I've gotta tell it like it is. That being said, I agree that everything else in the game is top notch. This is probably my favorite Mario game. I felt like a champion when I got all 242 stars (120 stars, plus getting them all again as Luigi, plus the final star you get for doing everything, plus getting AGAIN as Luigi.). Amazing game. Its just missing Yoshi. I went into this game knowing very little bit about it,I didn't read gaming websites really at the time and I was without a laptop as my girlfriend took it when we broke up a few months before..I used my Wii browser a lot but the quality of screenshots looked really poor through it so I really wasn't sure what to expect of Galaxy other than it being a 3D platformer.I knew it would be great of course as Mario games always are,I just didn't realise how great.Truly one of the finest video games ever made! Super Mario Galaxy 1 and 2 are what I consider the greatest games of all time! Awesome games! A really great game and definitely one of the best Mario games ever. The music, atmosphere, levels, and the story is amazing. I do think Galaxy 2 has more interesting levels, but you can't go wrong with either game. As much as I want to agree with popular opinion, I personally could not find the appeal in this game. Whereas each and every 3D Mario (before and after) left me contented after beating them, Super Mario Galaxy 1 left me with these words coming out of my mouth: "...that's it?". While I don't mind stories in games most of the time, I felt that SMG focused too much on the story, a similar problem to Super Paper Mario (though a great game, otherwise) in my opinion, and some of the gimmicks introduced in the game felt like either they were too tacky or just not expanded enough (particularly the Flying Star power up). As much as I like Luigi, I felt that his role could've been better in that he could've been used for better purposes (i.e. having him team up with you in certain puzzles or enemy ambushes in the game) instead of just "find him and get a star". And as much as I welcome the Prankster Comets idea, I feel that the comets are very unbalanced (the Fast Foe and Speedy comets were barely a problem in most cases) and the Daredevil Comets are just the absolute worst, especially in Melty Molten galaxy. Purple Coin comets would've been a fine idea, but the fact that some of the levels forces an unneccessary timer on you hurts the fun of it, plus hunting down those 100 Purple Coins became tedious for me, unlike Super Mario 64. Overall, I would honestly say that I enjoyed Super Mario Galaxy for what it was. I wouldn't call it a bad game nor a disappointing game, but a decent game at best. I was a little bummed after playing this until when Super Mario Galaxy 2 hit the store shelves and when I brought it to my house, I vastly enjoyed it to extreme lengths. Even though Super Mario Galaxy 1 is my least favorite 3D Mario title in the pack, I'll still remember it for the soundtrack. It's not my favorite Mario Game, but I did beat it over the Thanksgiving Break it was released. It was very addictive. I just didn't like going back with Luigi to redo everything. Apart from that, it was amazing. @PigmaskFan is that Mario after he jumps onto lava? 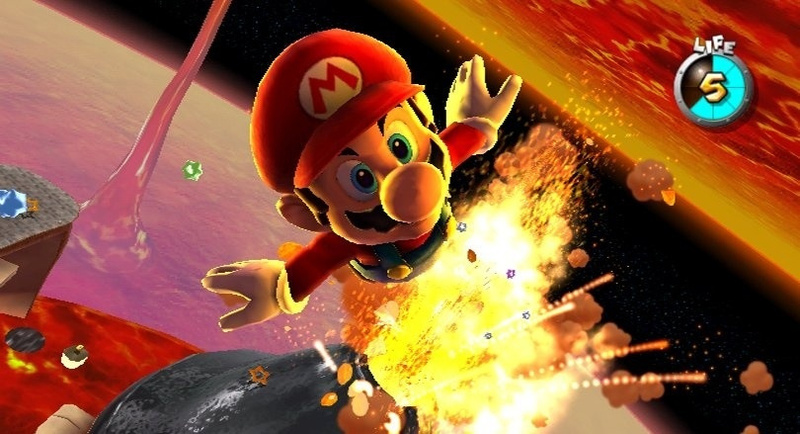 When I think of the year 2007, my mind goes straight to Super Mario Galaxy. So many up's & downs, but the time I spent locked up in a room playing this I will never forget. 2007, what a year! Definitely a great game, but for many reasons I didn't like it as much as SM64 or Sunshine. I did like it better than SMG2 and SM3DW, though. I truly love this game, it single handedly dragged me back to Nintendo gaming after I got bored with gaming in general. I was skint after backpacking and really had to milk my games as I had no money and lots of time.....Great memories, I played the while thing alone with a beaming smile!! I had to trade this in to get galaxy 2 (also great) so I'm looking forward to 're-buying' this one day and reliving the whole thing. I can't quite remember my star total so with everyone here talking about playing through as Luigi I'm almost hoping I forgot to get stuff!! this game is possibly the most fun you can have playing a video game alone. Imo. This was my new fav Mario until Galaxy 2 came out. That game was like 3x the content and challenge and had yoshi. I found it was a GREAT JOY playing it, but somehow – for reasons I can hardly specify – almost all of it was instantly forgotten after the game had ended. This is one of the reasons why I prefer Super Mario Sunshine. While I like Galaxy 2 a bit better than Galaxy, Its a very good game. The side stories itself proves it. I didn't like how linear it was (and I REALLY didn't like how linear the second one was) but I can appreciate it for what it was. Here I am still waiting for another open world Mario adventure like 64 and sunshine. To me, Galaxy stands together with Mario Bros. 3 and Mario World as the greatest Mario games. I like 64 and Sunshine immensely, but to me, Galaxy better captured the momentum and sense of direction that I associated the 2D classics with. @BulbasaurusRex I can't disagree more, the camera is great in smg. This took 3d Mario to the next level, a truly wonderful game it brings back so many great memories. Not my favorite Mario game by a long shot, but it still had some great moments. My main problem with the game was how linear it was. One huge detail that meant a lot to me though was giving Luigi a big role. I wish he got his own special missions, but at least he's playable! I also recently got a new sensor bar, so I'm jumping back in first chance I get! @Danrenfroe2016 Do you disagree with my analysis of the camera, or do you just not mind playing with that style of camera? Ironically, I much prefer the automatic behind-the-back cameras in the "Sonic Adventure" duology (except for the space level treasure hunting levels in SA2:B's versus mode, which uses the exact same annoying camera style later used by SMG; the camera in the story mode version of those levels is how SMG should've handled it for planetoids in space), yet I've often heard the camera listed as ones of the flaws of those games. While I agree that those games have a few notable flaws (the fishing and treasure hunting levels chief among them), I wouldn't consider the camera as one of them aside from the rare occasions it gets stuck or forces a bad angle on you. @BulbasaurusRex I disagree with your analysis of the camera. I think the camera is great. But... My wife would agree with you, she will not play SMG but will play SM3DW, I think she does not like the "upside down" feeling of SMG. @Danrenfroe2016 Well, by my analysis I mean the fact that it's a completely manual camera that almost forces you to run around sideways and upside-down. It's sounds more like you somehow just like playing that way. I remember when this game came out, I went to a GAME launch event (I wanted the free goodie bag LOL). I was expecting the game to be good but it totally blew me away, easily my favourite game ever. Easily one of my favorite Mario titles. It looks very nice, even compared to PS3 and X360 titles at the time. Not to mention the controls were very smooth and the soundtrack was very touching. I could listen to the original Gusty Garden's theme all day.